Get Radical! A Seminar in Community Organizing is a semester-long, hands-on workshops series about building social movements from the ground up. Eleven dynamic 2-3 hour weekly sessions will provide you with a range of practical skills, from finding money to finance your campaigns to honing your media skills, all with the goal of fostering meaningful engagement with relevant socio-political issues in our communities. It is open to undergraduate students and entirely FREE! Seminars will take place on Tuesdays from 4 PM – 7 PM between January 15th and April 2nd, 2019. Registration is required and participants must commit to attending all of the workshops. Upon completion, students will earn a Concordia Student Union Certificate in Community Organizing. Additionally, students may have it added to their transcripts on their Co-Curricular Record. To start off the series, we’ll get to know each other. Then, we’ll discuss and collectively determine common values and principles that will guide how we engage with each other and with this series over the next 3 months. Next, we’ll have two accomplished lawyers answer some questions that are crucial to activists, like what should you do if you get stopped by the cops? What if the protest you’re at is declared illegal? We’ll go over basic legal information as it relates to social justice campaign work, as well as available resources to empower you to keep fighting the good fight! 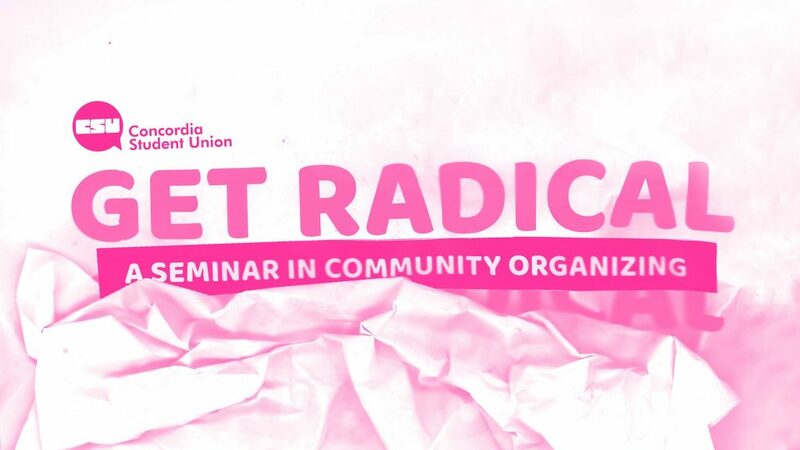 This workshop will provide a basic introduction to the rise of the far-right and the various groups that exist in Montreal, Quebec, and beyond. What is the far right, why is it growing, and how can we stop them? How are current groups connected to earlier fascist movements, how are they different, and what can we learn from the history of anti-fascist resistance? This workshop will be largely discussion-based, so please come with questions. As extreme far-right groups gain popularity, it is crucial to ask ourselves how we can collectively work together to counter the rise of the racism and neo-fascism. We’ll be joining the events commemorating the 50th anniversary of the Concordia Computer Centre Uprising, and learn from the original student activists about their involvement. This participatory workshop will explore different themes of injustice and use these ideas to create songs which we will sing together. We will learn how to craft a protest song and share tips and tricks on writing tunes that are catchy and easily shareable with a crowd. This workshop explores vulnerability, trust, and silliness, all of which can be useful within social justice organizing. Concordia has a rich history of student activism. This seminar will cover how to grow power and build alliances, as well as go over 10 lessons learned since Bibi’s failed visit to Concordia in 2002. So you want to coordinate a project relating to social, environmental, and/or economic justice, but you need some cash to get started? You’re in luck, because Concordia is home to tons of funds set aside for student-led projects! This workshop will provide you with straightforward information on funding sources available on campus and how to access them. This seminar will provide some historical context about student strikes in Quebec, focusing on the 2012 general unlimited strike that shook up the province and this very university. How did Concordia students get involved, and how was the strike different for us? What did the strike look like from the inside? What did direct democracy have to do with it? What were its successes and failures? An overview of first aid in the context of political actions, demonstrations, and large events. We will discuss medical ethics and patient consent, basic aid techniques, and how to apply them in both common scenarios (eg. pepper spray, tear gas) and less common scenarios (eg. broken bones). We’ll also cover mental health first aid and operating as part of a medic team. Participants will have the opportunity to acquire first aid skills while sharing their own experiences and practicing techniques. This workshop will give you the low-down on how to get the media to cover your events and actions. Organizing actions and edgy stunts is important, but getting the media to show up and publicize those big moments is key. From writing a press release to organizing a press conference to tips and tricks for talking to journalists, by the end of this workshop you’ll be a media wizard. The purpose of this workshop is to help members of marginalized communities, particularly artists and activists, to develop online self-defense tools to improve their own safety and privacy on the web. Through this, we are attempting to reclaim agency over our spaces, lives, and communities, both online and offline. We will cover basic “low-tech” security techniques related to one’s online presence, as well as techniques to counteract cyber harassment and online attacks (legal recourse, damage-control, self-care). This introductory workshop will not cover deeper cybersecurity concerns such as government surveillance and the gathering of information by corporate entities. Topic to be determined by seminar participants.